I finally got my first look at the new ENO JungleNest hammock today, and I am pleased and impressed. ENO has been in the hammock business since 1999, but it has taken them nearly 15 years to come out with a hammock with an integrated, zippered bug net. Honestly, I think the JungleNest is about 10 years late in coming to market, but I am pleased with how ENO has put this hammock together. It has all the right trimmings and attention to detail I’ve come to expect with the ENO brand. As of this writing, the JungleNest is out-of-stock; a testament to the demand (and popularity) of hammocks with integrated bug nets. They make hammock camping lighter and less complicated. The JungleNest follows in the footsteps of the Grand Trunk Skeeter Beeter Pro, Byer of Maine Moskito Kakoon, and Hammock Bliss No-See-Um No More in the basic design where the bug net is cut as long as the hammock body and gathered up at the ends (it isn’t fitted like the Hennessy or Warbonnet hammocks). But, the bug net isn’t just one flat piece, as it is one the other brands. ENO has engineered it so the seam matches up where the shock cord clips are located, and they’ve also added some fabric reinforcements on the side. ENO has added a few new features and modifications that set it apart. First, the bug net clips are adjustable from the inside, much like one of my favorite bug nets, the Equinox Mantis. The line is shock cord (a touch, which reduces strain on the fabric) and actually runs through the bug net. 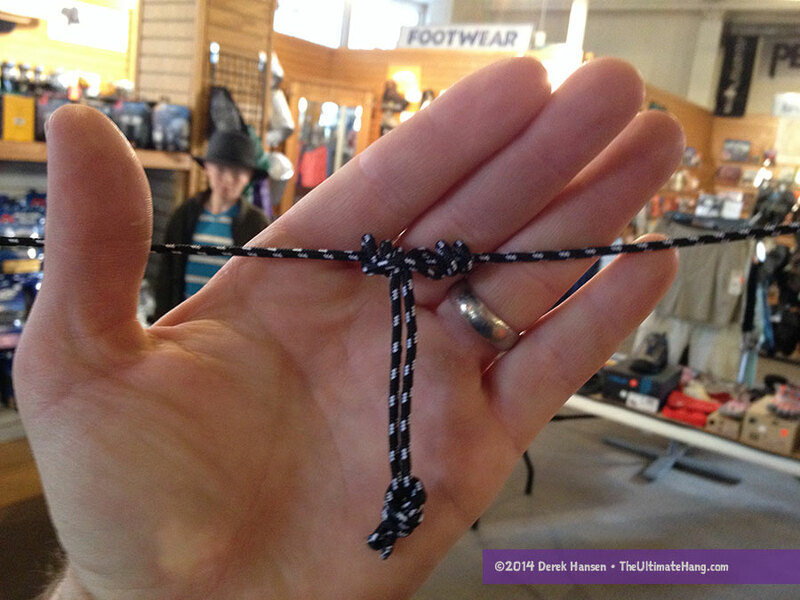 There is one of the ENO-riffic mini cord locks that allows you to tighten or loosen the netting while inside. Adjustable shock cord from the inside. One of my favorite thing about the JungleNest is that the fabric is one solid piece. 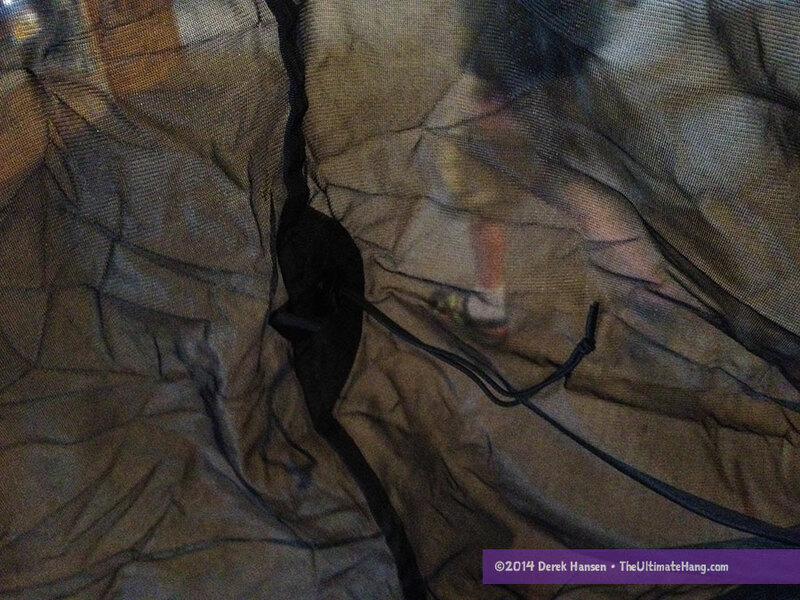 The fabric feels a bit lighter than the crinkle taffeta nylon (“parachute nylon”) ENO uses on its other hammocks, and it features a ripstop pattern. As much as I like the simple gathered end hammocks from ENO, Grand Trunk, and others, I really do not like how they use three panels of fabric in the construction. While it is nice to see the fruity color combinations, the seams where the fabric connects are uncomfortable to lay on, and I’ve noticed that most folks (myself included), tend to lay in the main center panel to avoid the ridge under head and foot. The JungleNest, in contrast, uses ONE LARGE PANEL! I can’t tell you how much I love that (am I repeating myself here?). In fact, up to this point, the only other manufacturer to do this with a hammock at this price point[1. Higher-end netted hammocks have been doing this for years, including Hennessy, Clark Jungle Hammock, Warbonnet, and DreamHammock. One large panel is much more comfortable not only because there are no seam bumps, but the seams also create tight ridges because they don’t stretch along with the rest of the hammock.] is the Hammock Bliss No-See-Um No More. I’ve favored the No-See-Um No More for this reason alone. Now I have a new favorite. Zippered organizer pocket on the inside of the JungleNest. You can see here how the bug netting has been engineered into panels to accommodate and reinforce places for pockets, etc. 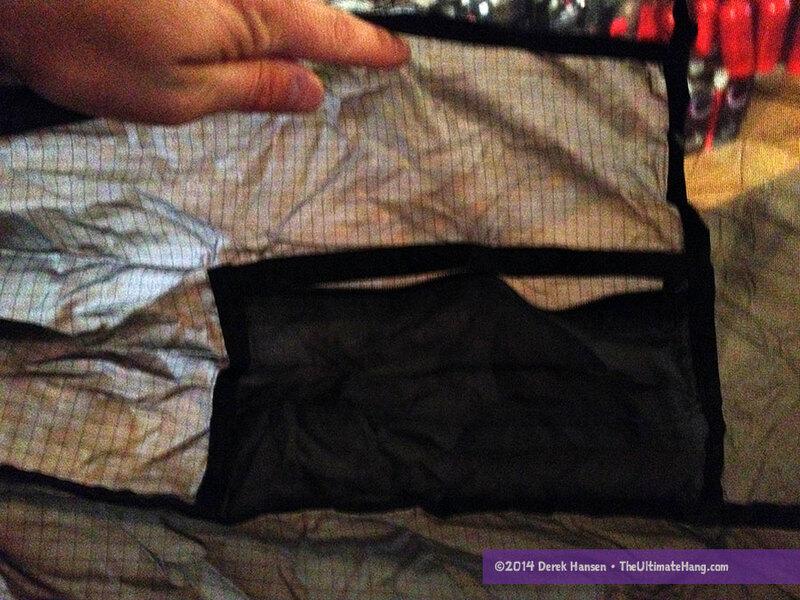 Also on the inside, and nearly easy to miss, is a small zippered pocket located near the gathered end. 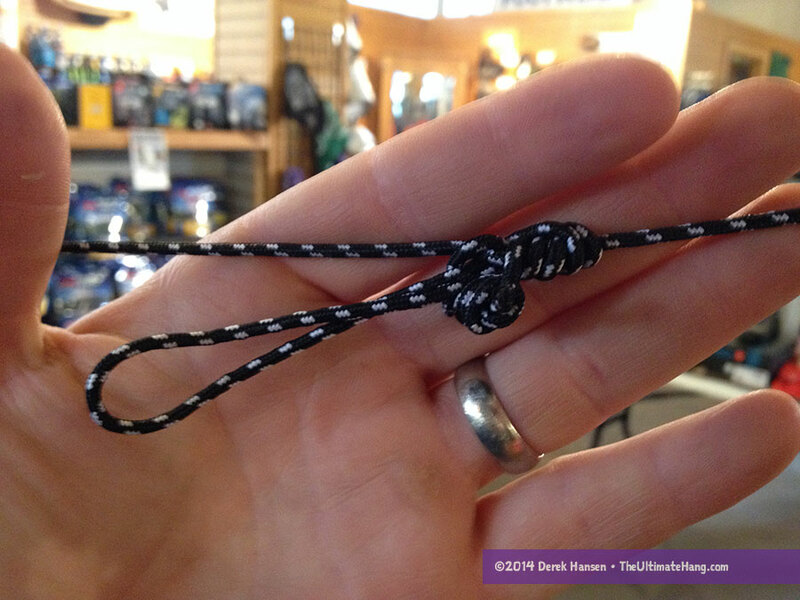 Inside this pocket was a length of cord that is designed as a ridge line where you can clip the bug netting. 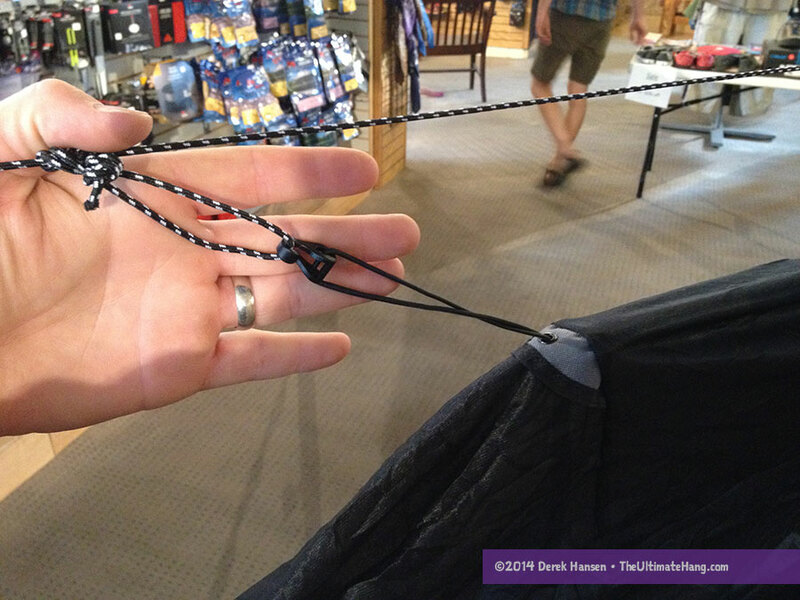 The line isn’t long enough to be used as a continuous ridge line that some folks are probably familiar with, but it will reach the hammock suspension, which works fine. The line is actually really stiff—similar to the line I found on the ENO tarps. I loved that ENO included two small cords, each about a foot (30 cm) long, that they had tied and used as prusik knots along the ridge line. Someone has been paying attention. The prusiks were made out of the same line as the ridge line itself, which normally isn’t recommended (it’s best to use a smaller diameter line on the prusik because it holds better). The prusiks themselves were very loose, and I found it was difficult to get them as tight as I needed to get them to grip. I took them off and retied the loop with a Fisherman’s knot and then tied on a Klemheist knot instead. This worked great and held very well. I retied the prusiks and turned them into Klemheist knots, which held a little better with the stiff cord. The stuff sack actually has a smaller pocket on the inside. This is a great addition to hold smaller items such as head lamps or smartphones, etc. It’s a nice touch. But How Does It Lay? The JungleNest is roughly the same dimensions as the Hennessy Hammock line, about 9.5 × 4.5 ft (3 × 1.4 m), and thanks to the single panel hammock body, has a great lay. Of course, this all depends on how you hang the hammock. If you pitch the JungleNest too tight, the lay will be constricted, contributing to shoulder squeeze and laying like a banana. With about a 30-degree angle from the anchor points, the hammock provides a nice diagonal lay with an ergonomically flat lay, just like all gathered-end, Mayan-style hammocks. I really liked the lay. It was comfortable and had clean lines. The bug net held up high and off my head. A side pull out near my shoulder would be a nice touch to keep the hammock and netting fully clear. The Junglenest is fantastic news for those of us that canoe and kayak camp on Florida’s coasts and interior waterways. I can’t wait to get one. Thanks for the thorough and objective review! Thanks! 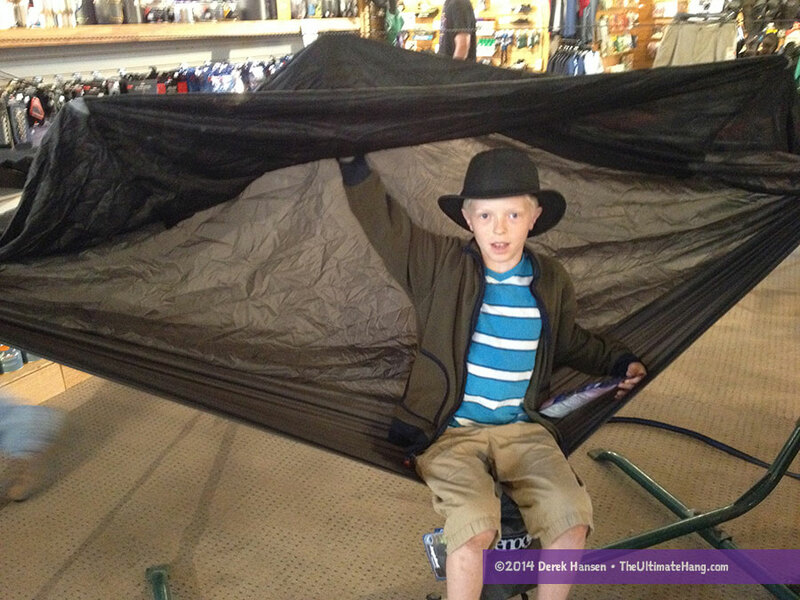 There are lots of other hammock models out there that have integrated bug nets, if you are looking for some. Let me know and I’ll send you a short list. A list would be appreciated. I recently retired my old canvas jungle hammock and the Junglenest with its one piece floor sounds attractive. Don’t forget to spray the bottom of the hammock with Permethrin or you will get eaten from the bottom. Thanks for the information on the new ENO JungleNest. I am first time hammock user and am looking for one with the integrated bug screen for my trips up to the BWCA. So far I have narrowed my list to the Bliss No-See-Um No More, Bliss Sky Bed Bug Free, and now the ENO JungleNest. I am about 5’10” and 230lbs. What are your thoughts on how you would pick from the this list? Or would suggest something else? That’s a good list! For me, I have some other factors that mean a lot: weight, pack size, and set-up time. Set-up time can be subjective, although I think that the JungleNest has some simplifications in the bug net that might tip the scales. The integrated pad sleeve in the Sky Bed may be a factor for some who want a no-hassle approach to using a pad (you can use a pad in all these hammocks, but the sleeve makes it a little easier). The hardest and probably most important consideration is what is the most comfortable. I don’t often provide subjective critiques like comfort as I’ve found that what I find comfortable is not universal. New to hammock camping myself. I purchased the eon double nest for a recent hunt trip to spike camp. I didn’t like how I couldn’t use my rei pro lite pad as the air channels would ride under my shoulder. Without the pad understand why hammock camping is preferred by you and others. The jungle nest with one panel how is it with a pad to sleep on? I’m looking to upgrade as well as a tarp, the poly tarp is too bulky to pack but needed from the monsoon storms that rolled in, recommend a tarp? When I read “monsoons” I wondered if you are from Arizona? I live in Flagstaff and quite enjoy these seasonal monsoon rain storms 🙂 Getting a good tarp is key for staying dry, but also knowing how to pitch it. A hex-shaped tarp is a workhorse tarp for hammocks and is the most fool-proof in terms of all-around coverage. A hammock made from a single panel of fabric and one with three panels will handle a pad equally well (or equally bad). This isn’t so much the hammock’s fault — pads are designed to be rigid and flat and they don’t flex and bend like the hammock does to conform to your body shape. The Jungle Nest, with the integrated bug net, will help keep the pad from falling out, but it will be about the same in terms of keeping the pad under you. There are hammocks that are made with two layers, one on top of the other, that creates a sleeve where a pad can be sandwiched. 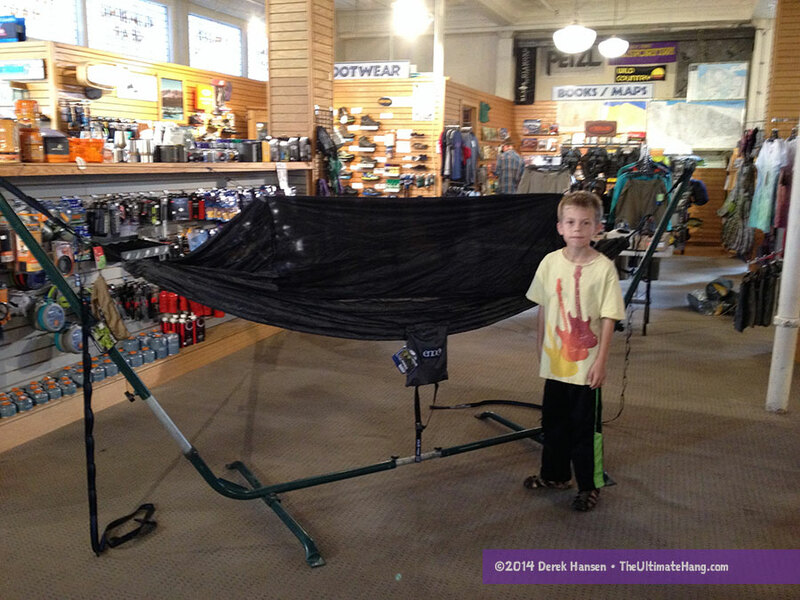 ENO sells one called the Reactor Hammock. Some hammocks are sewn with a pad sleeve, which acts in very much the same way. One way that I use pads with hammocks, or at least recommend to folks, is to put the pad inside your sleeping bag. In this way, you use the sleeping bag as the pad sleeve, which prevents the pad from rolling out from under you. One of the best solutions for staying warm below is an under quilt. Check out my book for more details or send me a PM. I’m new to hammock camping and but was lucky enough to get a Junglenest 🙂 I do not like the vertical zipper on the Guardian Bugnet so the Junglenest was perfect. It is very comfortable in hot weather, can’t wait to try it in cold. I also purchased an ENO Profly tarp and the Slap Straps. I’m 280 lbs and have experienced a lot of stretch with the suspension so I’m currently using the Slap Straps as tree huggers and 1/4 StaSet poly deck line (rated as only 2% stretch). Big, big difference. Congrats on the hammock! I would upgrade to the atlas straps. They are poly based and don’t stretch like the slap straps do. I agree with Derek regarding the Atlas straps. They have virtually replaced the Slap Straps for the same complaint you mentioned. The Atlas straps also have several more loops for more attachment options and flexibility. I plan to. What kind of hammock stand was used in your article? The one pictured here is the vario stand. EMO seems to be out of stock for pretty much everything. Are they still in business? Yes. They do a lot of business. They are one of the top retailers. That said, inventory problems are more a management issue. REI just completed a huge Labor Day Sale that pretty much cleaned out a lot of inventory. ENO hammocks — SingleNest, DoubleNest, JungleNest, and OneLinks were all 30% off the regular prices. I bought a JungleNest and have one more and two OneLinks on backorder at their sale price. Wish the straps and flys were on sale too! I like them both fairly equally. My python straps have seen a lot of abuse and held up well. Is the mesh a similar size to the hammock bliss sky bed bug free hammock. Is it 2100 square hole as well? ENO doesn’t list the hole count, just that it is “no-see-um” mesh. It appears to be similar to most brands. I will say that the Hammock Bliss netting is much more robust than any other I’ve seen on the market. What are your thoughts on the JungleNests ability to keep my backside from being bit? Currently I have the Guardian Net around my SingleNest which obviously keeps me protected. But as you noted the simplicity of the integrated net can’t be beaten. So long as it doesn’t compromise my protectedness. Like all hammocks, your backside can still be a mosquito target if they can bite through the material. One easy way to solve this is to treat your hammock with Premethrin each season. However, during most of the camping season, it’s very likely you will be using a sleeping pad, bag, or other insulation under you, which will prevent bite throughs. Even some double-layer hammocks are enough to prevent bite throughs. There are only a few two-person hammocks on the market, and even then, they are designed so each person has their own “bed” area that is separate from the other. Sleeping two people in the same hammock is much like synchronized swimming in a fishbowl: some folks really like it, but they are a rare breed. I’ve found that the best solution is to have two separate hammocks that are hung in bunk bed style or side-by-side, both covered by the same tarp. It’s a very coy arrangement. There are tradeoffs because it is not possible to share insulation like you might in a tent.